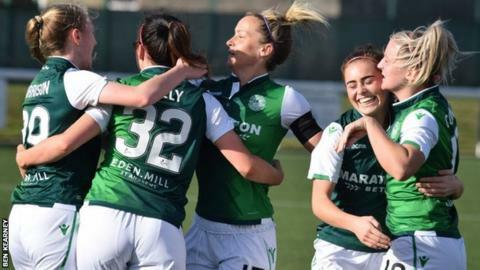 Jamie-Lee Napier and Kirsten Reilly can help fill a void after Hibernian's pre-season exodus, says coach Grant Scott. Both were outstanding as last season's runners-up fought back to beat Celtic 2-1 at Ainslie Park after their opening day goalless draw with Spartans. Reilly scored both goals, while Napier led the line brilliantly for a side rebuilt following the loss of eight players since last term. "This was a big win for us to get back on track," Scott told BBC Scotland. "We know what we've lost and it's difficult to replace that kind of quality. Jamie-Lee has had a year of working with us and she's really stepping up. She's a leading player in the group. "Kirsten is a wee bit older but under the radar really. She joined last year, grew into the season, and she's started really well this year as well." Celtic arrived in Edinburgh having beaten Forfar 4-0 in their opener, but were facing a side who had not only beat them four times last season, but hammered them 9-0 and 7-2 on two of those occasions. If they are serious about challenging for the title, they had to show it in games against Hibs and Glasgow City. And they showcased that intent straight away, flying at their hosts and taking a seventh-minute lead when Natalie Ross side-stepped her marker and drove a low shot into the net. Hibs were rattled, then depleted, when Leah Eddie was carried off with a nasty-looking injury after appearing to hit the fence that surrounds the pitch. With Rachael Small and Shannon McGregor already missing, it was another blow to Scott's side. But they battled back and got their reward for their pressure when Chelsea Cornet nodded Colette Cavanagh's free-kick into the path of Reilly to head Hibs level. Then Reilly's stunning free-kick put Hibs in front, curling the ball delightfully over goalkeeper Megan Cunningham. A scrappy second half was punctured by constant fouls, but Hibs always looked comfortable as they held on for the three points. Glasgow City captain Leanne Ross said her side had delivered a "fitting tribute" to Kat Lindner, the former midfielder who died last week at the age of 39, by beating Spartans 7-1. Kirsty Howat score a hat-trick as Ross wore a special shirt with the number seven and Lindner's name on the back. Elsewhere, Rangers beat Stirling University 4-1, while there was controversy at the end of Forfar Farmington's 3-2 win over Motherwell. Kerry Montgomery thought she had scored a dramatic equaliser, but the referee blew the full-time whistle just as she was taking her shot from the edge of the box and disallowed the goal. In SWPL 2, Hearts thumped Hutchison Vale 9-0 to make it two wins out of two.